Akanksha Gupta received the Illinois Technology Foundation’s Fifty for the Future award. Akanksha Gupta (MS ’18) describes herself as an ambitious person. She likes to set lofty targets and intermediate milestones for herself, and she enjoys each piece of work needed to get from one point to the next. 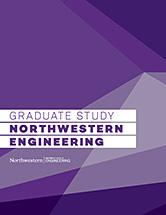 It is that ambition that first brought her to the Master of Science in Information Technology (MSIT) program at Northwestern Engineering, and it is that same ambition that led to Gupta receiving the coveted Illinois Technology Foundation’s Fifty for the Future award. That dream is centered around a career in digital analytics and marketing strategy. Although the MSIT program is not specifically designed for marketing professionals, Gupta was intrigued by the program’s unique curriculum and flexible course structure. She chose the program as a way to hone her analytical skills. “I was looking to build on my technical acumen, and this program was a perfect match with what I needed,” Gupta says. “Because of the flexible course structure, I was able to take marketing courses and courses with other departments that were in line with my career aspirations. As a student, Gupta helped lead a team of MSIT students in an online marketing challenge run by Google. The team worked with Curt’s Café, a non-profit café in Evanston that supports at-risk youth, to help run a Google AdWords campaign. The team placed 17th out of 930 teams in the America region. After receiving her degree, Gupta became a senior marketing analytics and insight expert at CDW Corporation. Now based in Dubai, she currently is looking for a similar position.